Once again I have lapsed into my old writer’s block and have done precious little since the last month. 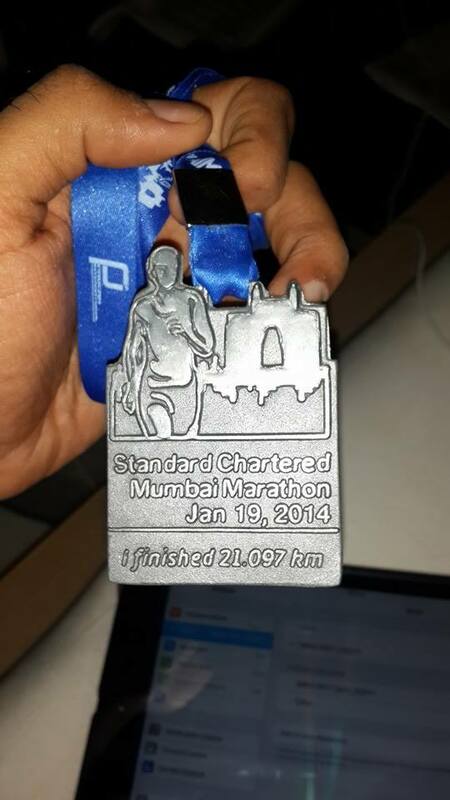 I am now back with my long pending update on the Standard Chartered Mumbai Marathon (hereon known as SCMM) 2014. Carrying on from last time, after the adrenalin rush and sense of achievement of the Mathe-Run, it was time for a different challenge. 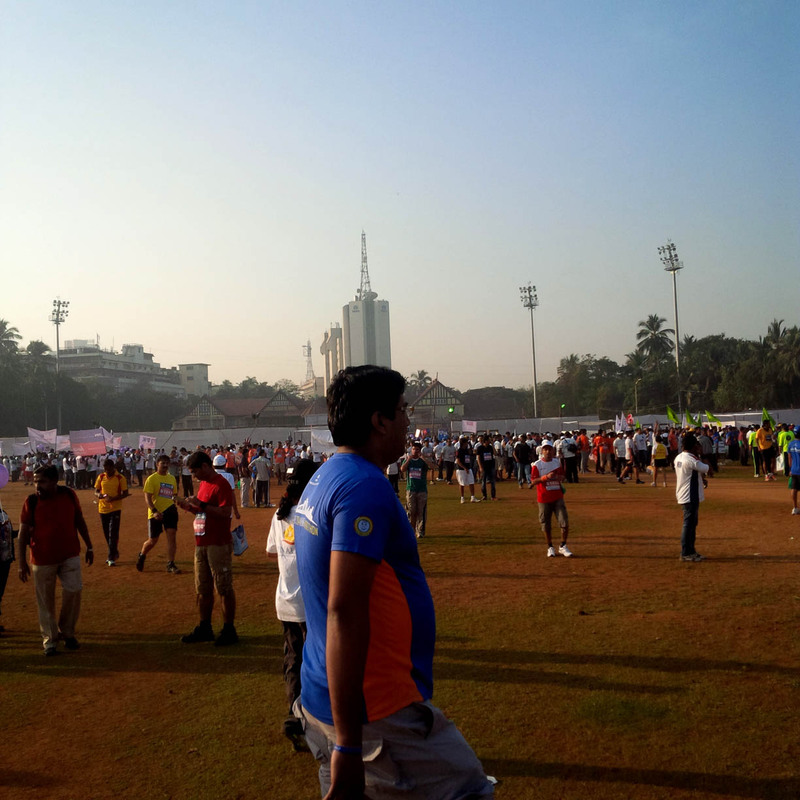 The SCMM was round the corner (19th Jan 2014) just a week away; but there was no real excitement since it was only going to be the 6KM run. 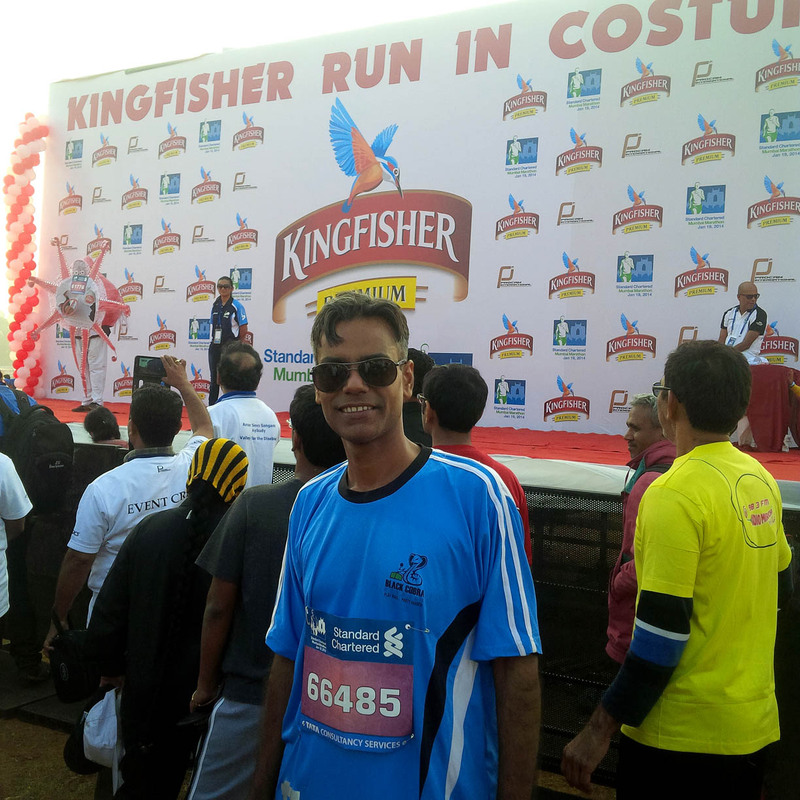 When we had registered in August/September 2013, we had never run anything at all, and whilst we had wanted to go for 21 KM, we were thwarted by the fact that SCMM required some online timing certificate/proof to be a timed runner. Having nothing in hand, we decided to opt for the 6KM, which we had felt would be enough to test us. 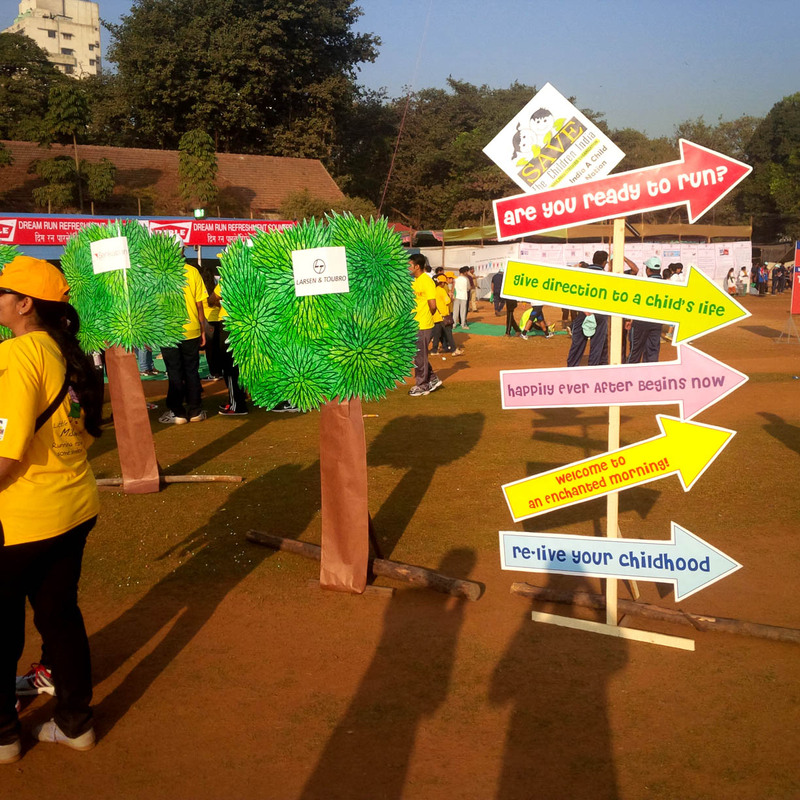 Now, after having done a couple of 10K runs, the Dream Run did not feel appealing at all, however, we were glad to be part of the spectacle and were curious to soak in the atmosphere of the biggest run in Asia. Come Jan 19th, Sunday, and all roads and trains led to CST (formerly known as the VT station) Our run was to begin at 9 am, and we got off the train at Churchgate at 8:15 and proceeded towards CST. The carnival like atmosphere began the moment we stepped out of the subway. 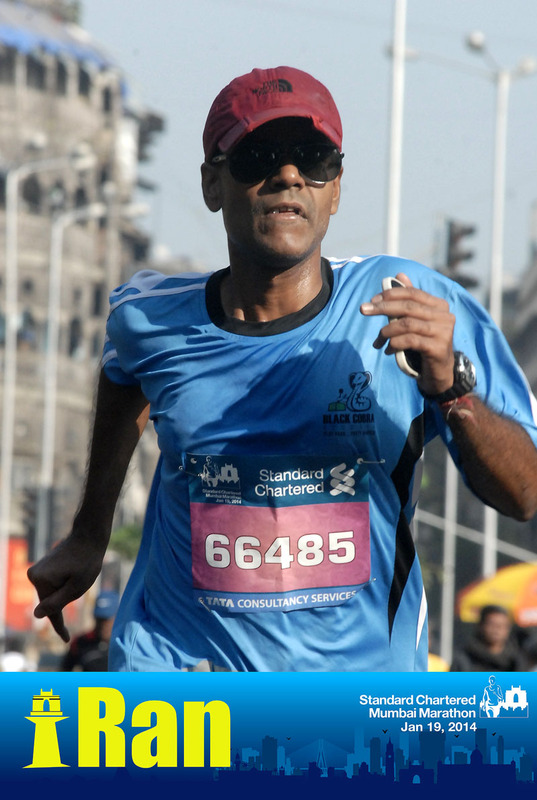 Across Eros Cinema, was a group of dancers with loudspeakers blaring “Bhaag Milkha Bhaag” There were throngs of people lined along the barriers cheering on the runner who were streaming in a steady line from Marine Drive (these were the 21K runners who had begin early in the day from Bandra Kurla Complex) There was music and colour all around and it was fantastic! 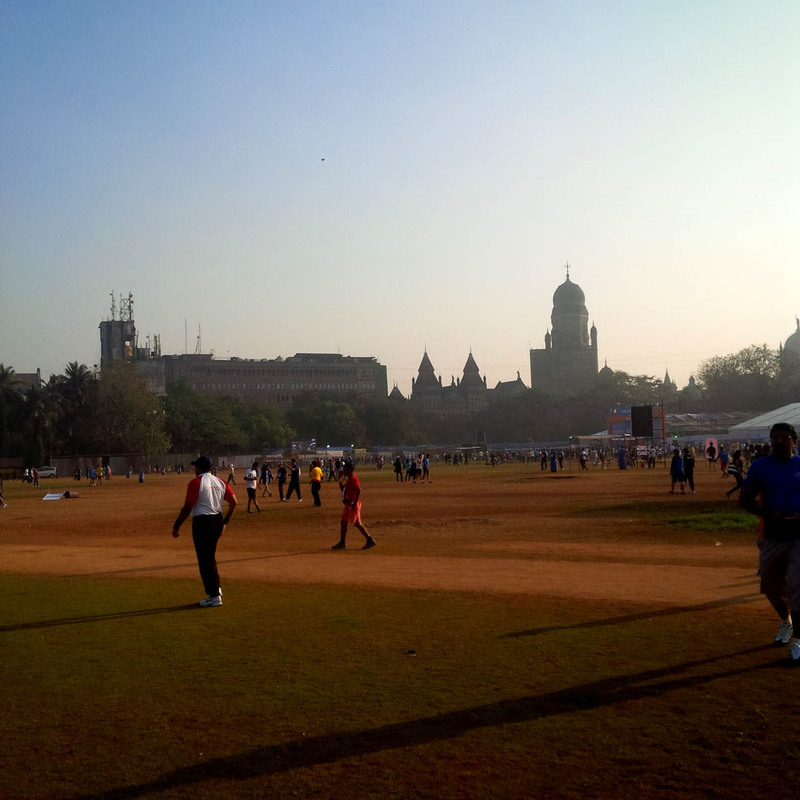 We walked briskly to the holding area at Azad Maidan and entered from the Bombay Gymkhana side. Outside the entry, was a huge crowd of people in various costumes, carrying banners, flags, and shouting slogans. It was like a human tide throbbing and pulsing in myriad hues! 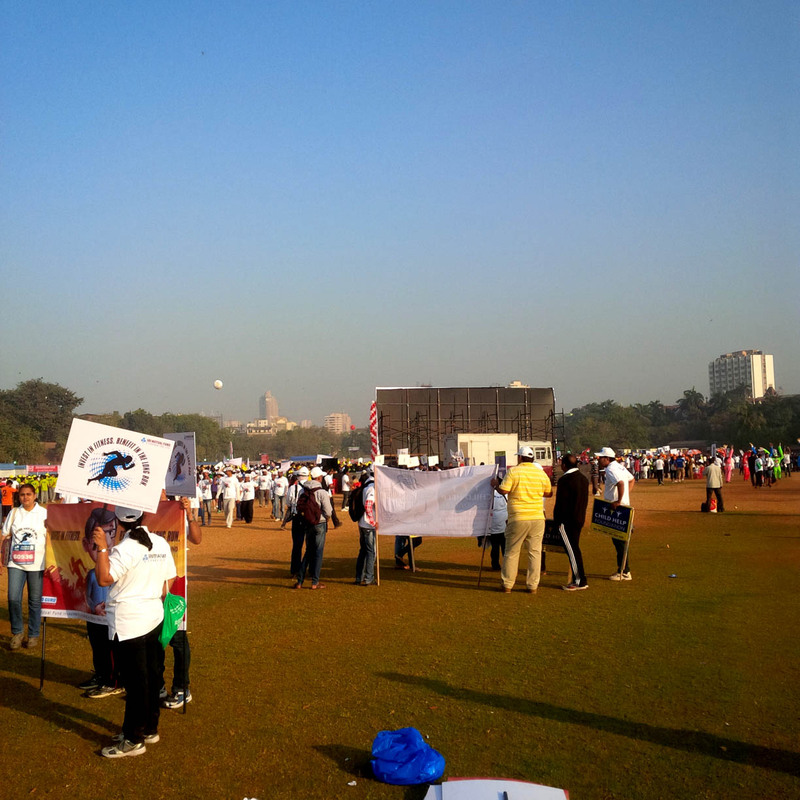 As we entered Azad maidan, we saw a stage surrounded by the crowd. People who were dressed in special costumes based on their causes, were taking centrestage and describing what they were involved with. Dude in Octopus costume explaining his cause – Corruption is like an octopus, we need to fight it! 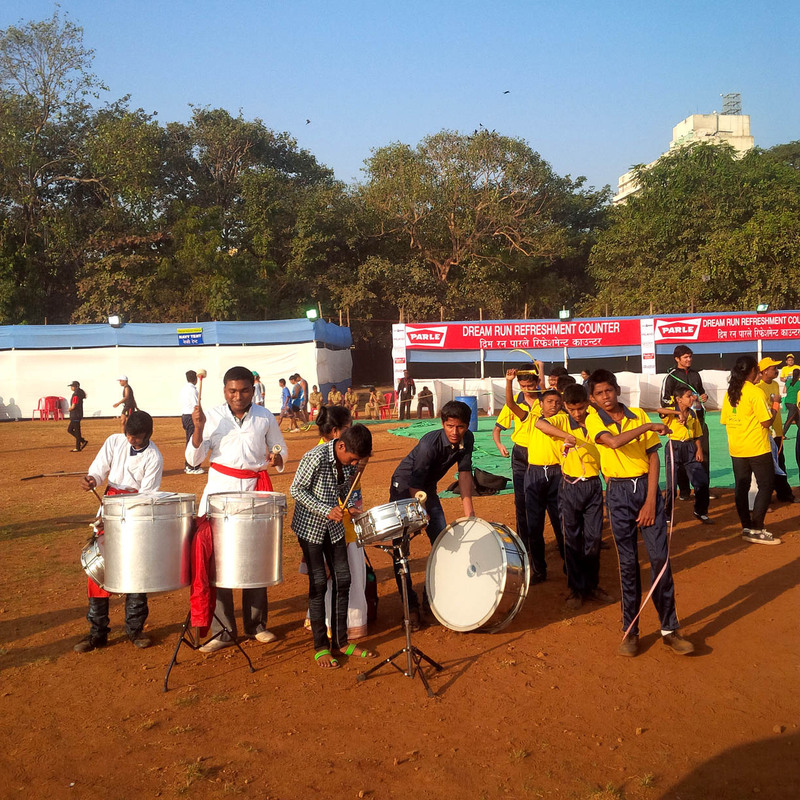 In the distance, a group of school kids were playing lezim, while others were banging on their drums. 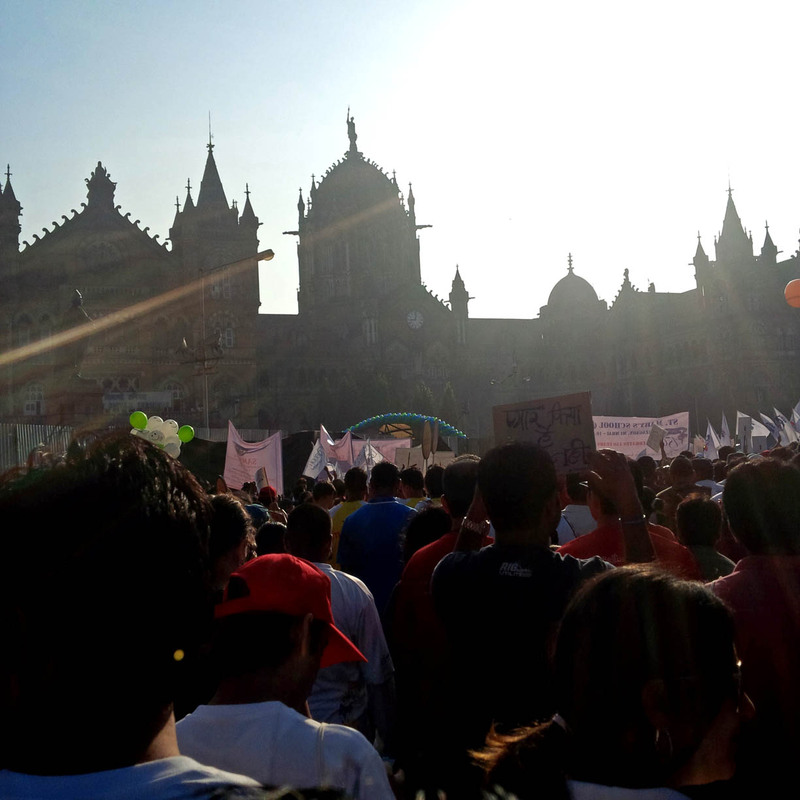 A short while later, the huge crowd started surging through a narrow exit lane onto the main road leading to CST. 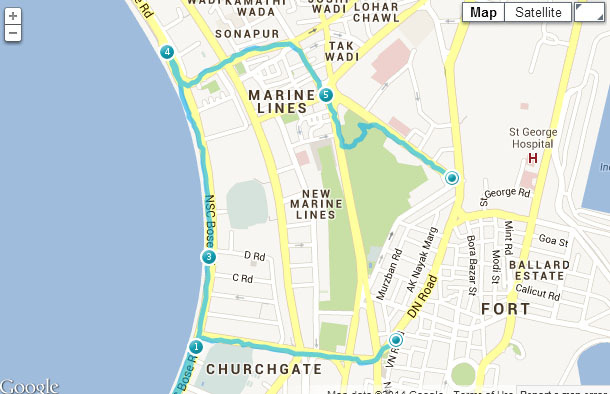 The start point would be the BMC building and DN Road junction. 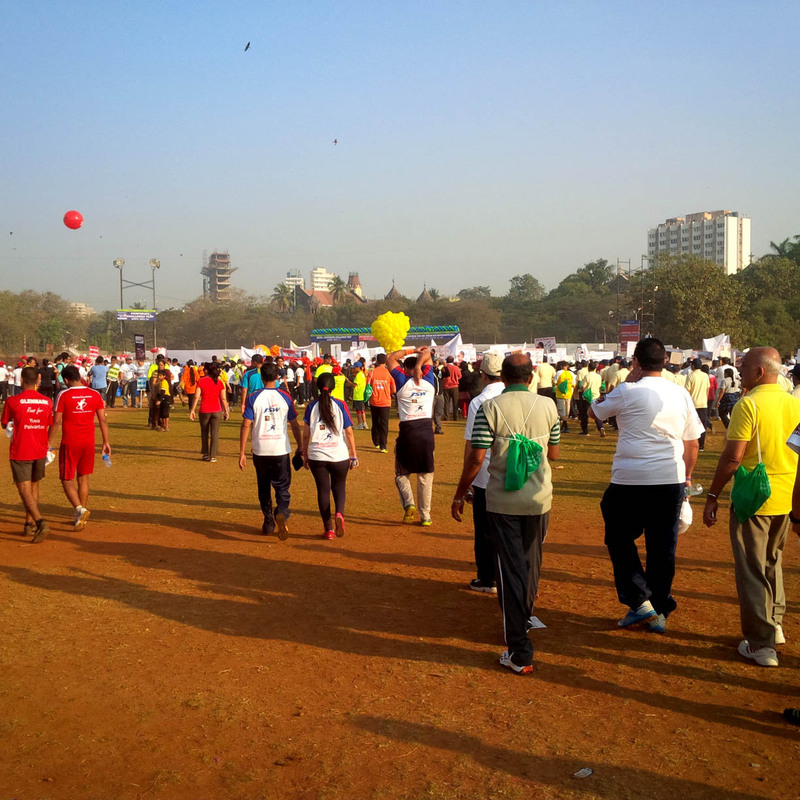 Finally, hearts pumping, drums booming to the side, we are at the VT station – run about to begin. As we got closer to the start point and the start time, the sound of the drums got louder and faster until it was a thumping beat that threatened to make everyone rush headlong onto the road…and in a few seconds, the entire throng was off. Tapan left me just a short while after the Oberoi Hotel turn and raced ahead while I slowly picked up my speed as I reached the 4.75 km mark at the Marine Lines flyover. This was the ONLY part that wasn’t flat and even then the climb is not that difficult or extensive. Climb the flyover and then its an awesome race down the incline (which unfortunately got thwarted for me as a group of runners were clustered all across the road and chatting and sauntering across) I waved out cheerily and slowed down to avoid any mishaps and then after I touched the bottom of the flyover, began the final sprint to the end which was opposite the Metro Cinema. It was a fantastic end to a fantastic experience … a true carnival that has so much life and so much character that it has to be one of the best run experiences worldwide! To anyone who has never run and to all experienced runners, this is a run you MUST do. The atmosphere, the sheer energy…will ensure you will never forget this! As I close my memories of the run, I finally remember that I have not mentioned the time at all…it was that kind of race, where you ran hard but enjoyed it so much that time was secondary! 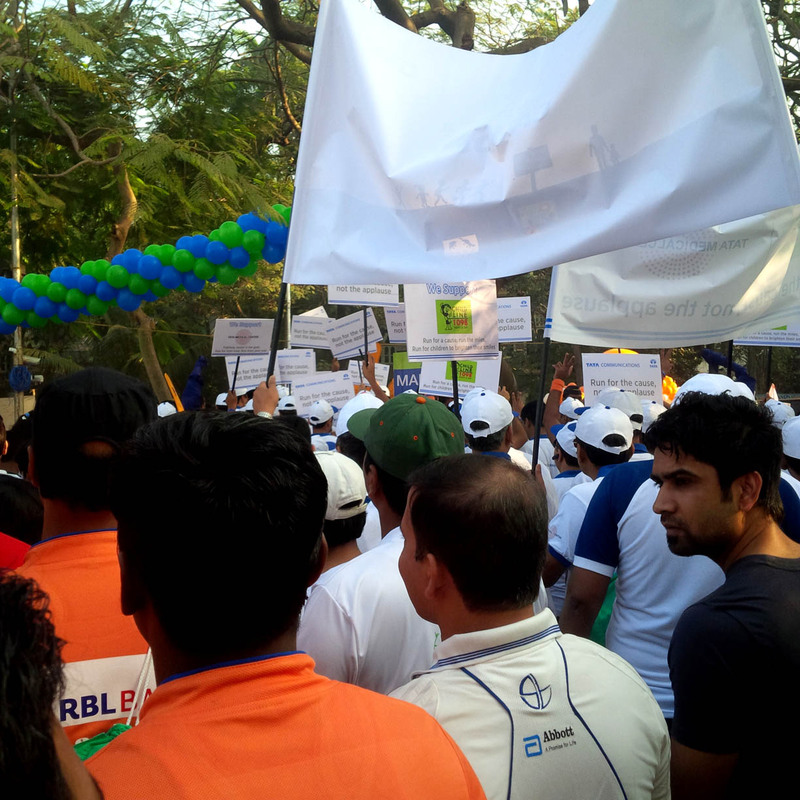 I did the 6k in 32 minutes while Tapan did it in 31 minutes. This was our fastest 5/6K run to date and we both enjoyed it thoroughly!